Is one right for your pool, spa, use, and climate? Because heating a swimming pool & spa impacts homeowner utility costs, the smart approach is to determine which kind of heating system best suits your needs and can save you money. Whether you are planning a new backyard resort or modernizing the equipment on an old one, you want to know if an electric heat pump is a better choice for your pool & spa than a traditional gas heater. There is no “right” answer for everyone. Gas heaters are popular for a reason, but under the right circumstances, heat pumps are a superior fit. When choosing a system, what matters most is how and when you plan to use your pool & spa, coupled with your local climate and length of swim season. Before considering possible advantages of heat pumps over gas heaters, let’s take a look at the basics of how these devices function. The first distinction is that heat pumps don't draw on a power source, such as natural gas; rather, they run on electricity. However, it is not the electricity that directly ups the thermometer mercury; it is the unit’s ability to extract heat from the ambient air outside and then use it to raise water temperature. This heating method involves a cyclical process, which is described in detail on the federal energy.gov website. According to the website, the beauty of this “what-goes-around-comes-around process” is that for each unit of electricity the heat pump needs to operate, the system produces more than a unit of heat. That makes heat pumps more than 100 percent efficient when it comes to thermal efficiency. Compare that to the 82% to 84% rating on traditional gas heaters. For example, if a gas heater is rated 84 percent efficient (a top model), it actually wastes 16 percent of its fuel. In contrast, an algorithm called the coefficient of performance (COP) is used to measure heat pump efficiency. The higher the number, the greater its efficiency. Energy.gov explains that COPs for heat pumps typically range from 3.0 to 7.0, which translates to 300 - 700 percent efficiency. For example, a heat pump with a 7.0 COP produces seven units of heat for every unit of electricity it consumes. While heat pumps may trump gas heaters in terms of efficiency ratings, this claim to fame does not automatically make them the winner for “real-life” efficiency. There is more to the story. One reason is the cost to purchase a pool pump. Prices for new gas pool heaters run lower than those of heat pumps—typically about 25 to 30 percent lower. That difference easily translates into hundreds of dollars up front. Still, that hit on your wallet does not necessarily mean that a gas heater will save you money. Another aspect to consider is that heat pumps tend to last longer than gas heaters, so you will not have to replace your unit as soon. The other key is operating costs. If you plan to heat your pool year round, a gas heater can cost up to twice as much to run as a heat pump! Now, most pool owners don't fire up their pool heating systems with that degree of regularity. 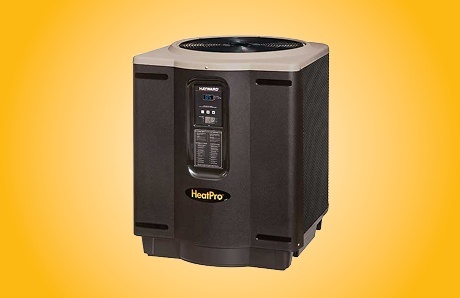 However, for devoted swimmers who want to get in their daily laps in comfortable swimming environment, a heat pump can be an affordable salvation—but only in some cases. Read on. Heat pumps work efficiently, but not quickly. Keep in mind that scoring points for efficient heating does not equate to efficient speed. Heat pumps work well for maintaining water temperature once it hits the desired temperature. But here’s the rub: Heat pumps take much longer to get it to the target number in the first place. What that means is the amount of time needed to heat a pool is something about which you simply cannot underestimate the importance. If your family uses your pool infrequently and often on short notice, a gas heater can boost the temperature much faster. Yes, it will cost more to use, but it will get the job done effectively and in less time than a heat pump. 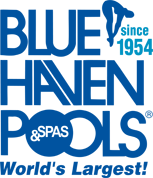 When it comes to pools with spas, the choice is clear: Since, heat pumps take much longer than gas heaters to warm water and achieve higher temperatures, you will want a traditional gas heater. Period. Ignore this advice, and forget about quickly firing up your spa to soak in hot water. Heat pumps make sense for warm weather regions—or for short pool seasons. Drawing warmth from surrounding air and transferring it to a pool or spa requires cooperation from Mother Nature. In other words, where you live in the U.S. matters. Parts of the country where the regular winter temperature is typically at least 45 degrees Fahrenheit make heat pumps a good solution for keeping pool temperatures up and operating costs down. Do note that some moisture in the air is also needed for heat pumps to function properly. That makes them an option in metropolitan areas with moderate winters, typically in Sunbelt states like Alabama, California, Florida, Georgia, Louisiana, Mississippi, and Texas. However, they are not candidates in hot—but dry—desert climates like those in Nevada and Arizona; humidity levels there are just too low for heat pumps to work efficiently. The surprise is that heat pumps can be a great choice in cold-weather regions like the Northeast and Midwest, but only if you plan on short swim seasons. If you use your pool during only warm spring and summer months when outside temperatures run high, there will be the needed warmth for your heat pump to effectively operate. Consult an expert before choosing your pool’s heating system. Because factors affecting pool & spa heating can be complex, the best course is to discuss your needs with your pool builder or with a service technician. A professional can help you determine if you are better off sticking with a traditional gas heater, or if a pool pump can serve as a good, money-saving match for your pool and your family’s needs.